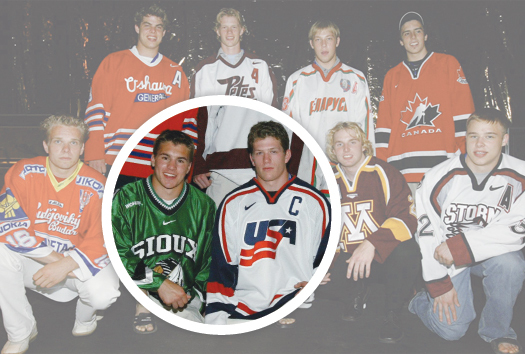 Over the years, Ryan Suter and Zach Parise have teamed up on international ice. After their blockbuster free agent signing, the young Americans will look to re-energize the Minnesota Wild. It was a warm July evening, and on the concourse of the Minnesota Wild’s home rink, one could barely make his or her way through the crowd. And at the center of all the congestion were arguably the three best-known names on the local hockey scene these days. Sitting in a motorized wheelchair, as the guest of honor at a fund-raiser that would net more than $120,000 for his medical bills by the end of the night, was Jack Jablonski, the 16-year-old from the Twin Cities who was paralyzed in a junior varsity hockey game last winter. Flanking him on both sides were two men who, a few weeks earlier, didn’t even work here, and who seemingly overnight had become the spotlight attractions in a region where hockey is a big part of everyday life. The Wild’s July 4th signing of Zach Parise and Ryan Suter to massive free agent deals re-ignited the fire for the NHL game in the self-proclaimed State of Hockey. On this night, that renewed mania for the home team and its newest stars was evident, as Stanley Cup winners and Miracle On Ice players were acknowledged, but the autograph lines for Parise and Suter stretched seemingly around the rink. There was a honeymoon of nearly a decade when the NHL returned to Minnesota via the expansion Wild in 2000, as no seat inside the Xcel Energy Center went unsold for the franchise’s first 409 games (preseason, regular season and playoffs). But all honeymoons come to an end, and empty seats had started to pop up in bunches at Wild games as the team went four seasons without a trip to the playoffs. The lead owner Craig Leipold and general manager Chuck Fletcher knew that a bold move was needed, both from business and hockey standpoints. When NHL free agency opened on July 1, the two biggest names available were Americans. Suter, 27, had just completed his seventh season on the Nashville Predators’ blue line. Parise, also 27, had just help lead the New Jersey Devils to the Stanley Cup Finals. The pair had been fierce rivals in Junior hockey and again in college, as Suter went to the University of Wisconsin while Parise played at North Dakota. But when they’d teamed up, there were medals won for Team USA. Both Parise and Suter were part of a deep NHL draft class in 2003. The pair helped the red, white and blue to its first-ever gold medals at the IIHF World Under-18 Championship in 2002 and the World Junior Championship in 2004, and nearly struck gold again in Vancouver at the 2010 Olympics. A nation of American hockey fans screamed with joy when Parise’s goal with 23 seconds left in regulation sent the gold-medal game to overtime. They ended up with silver medals – one notch below the gold that Suter’s father, Bob, won as a member of Team USA in 1980. So with those dynamic Americans on the market, the “usual suspects” were mentioned in the U.S. and Canadian media as the likely landing spots: the Rangers, the Red Wings, the Penguins, the Flyers, even the Stanley Cup champion Kings. But lightly regarded Minnesota had a hometown advantage. Parise grew up in Bloomington, Minn., and his father played for the North Stars. Suter’s wife is from Bloomington, and the couple didn’t mind the idea of playing less than four hours from his hometown of Madison, Wis.
Parise spent the first couple of days in July in Toronto with his agents, receiving and considering offers, then flew to his summer place in the Minneapolis suburbs to mull them over, and make a decision. Suter was at his farm outside Madison and let the game come to him, as representatives from the Red Wings and Wild flew to Wisconsin to make him offers. On the blisteringly hot morning of July 4, Leipold joked that the Independence Day fireworks exploded a little early at the Wild offices, as he and Fletcher, and eventually the entire State of Hockey, received word that the two biggest free agents available were a package deal, and would be wearing green and red next season. The price tag was considerable – both players signed 13-year contracts worth $98 million each. But the payoff, from a business standpoint, was immediate. The Wild had to call in additional personnel to answer phones as season ticket orders numbering more than 1,500 had come in before the announcement was a week old. Most experts seem to think that an on-ice turnaround is forthcoming as well. In June, Las Vegas odds-makers had the Wild as a 75-1 longshot to win the 2013 Stanley Cup. After the Parise and Suter signings, that number had dropped to 18-1. And to that end, the players know that once the hype from their arrival dies down, the pressure to perform, and live up to that buzz, begins. The Wild had the best record in the NHL last December, with rookie coach Mike Yeo leading the charge. Then the injuries began to mount, and by the time the playoffs began, Minnesota was an outsider once again. Now Yeo has been given a new set of tools to work with, and fans are salivating about a combination of Parise, Mikko Koivu and either Dany Heatley or Devin Setoguchi on the top line, with Suter anchoring the defense. The Northwest Division is looking much more competitive as well, with Vancouver and Calgary seemingly in decline, while youthful Colorado and Edmonton teams seem to be a few years away, leaving the door open for a suddenly stacked Wild team. With more than a dozen years as teammates ahead of them, Parise even hinted that this could be the start of a seismic shift in the NHL, with Minnesota and its ingrained hockey culture set to join Boston, Detroit, Chicago, Pittsburgh and Philadelphia among the “major market” teams in the pro game, and the prospect of sellout crowds and playoff trips in a community where the fans know and love the game could mean more free agents heading their way. “The building is great, the fans are great, the people are nice, and it’s a great place to live,” Parise said, mentioning many friends that he and Suter have in the NHL – friends that might be persuaded to come to Minnesota in the future. But for now, there are two new sports celebrities in town, and a newfound buzz about the game that so many Minnesota kids grow up playing on backyard rinks, dreaming that they’re the next star to skate in the state hockey tournament, play for their favorite college, wear the red, white and blue, and then earn a paycheck with the Wild. Already in the heat of summer, Wild sweaters with “PARISE” and “SUTER” on the back were showing up at the beaches and on the streets, as never-before-seen off-season hockey hype has gripped the state. For many Minnesotans that savor the warm months of summer, suddenly the cold winter, and the hockey season, can’t get here quickly enough. Jess Myers is a contributing editor to InsideCollegeHockey.com.